The board of the team Cruz Azul has offered us (Umbro) a great challenge. Capture the renewed footballing spirit the team has launched in every sense throughout their match kits. Reflect the attitude of risk and courage they took when bringing big names while trusting players from their youth ranks as well as enthusiastic young foreigners. With this philosophy, we have been inspired to have taken the chance to break paradigms and at the same time, create an original garment, distinguished and with unequaled technology and quality, just like the quality of Cementos Cruz Azul. The color was a fundamental part: it had to be a commercially appealing, original, daring, and elegant color. With this profile of characteristics, we got lots of ideas, the most spectacular and original of which being, paradoxically, the most simple. We returned to the roots of Cruz Azul, to the cementers, to the coop laborers, to the sacks of cement, to the sand of the hill of limestone, and from this we came to the color sand. We added some vanguard design elements and on the back we used a fabric with Body Mapping, a weave which outlines the contours of the human body, following the shape of the muscles and the skeleton, thereby guaranteeing the players’ total and absolute comfort. Morever, every back is unique and it has to be aligned piece by piece in such a way that each size adjusts perfectly to this ‘Map of the Human Body” turned into a fabric. To this garment has been applied with the nano molecular finish which provides extraordinary lightness, weighing only 180 grams with which complements a spectacular garment and with the highest technology in all the continent. Introducing the new Umbro Cruz Azul match kit. 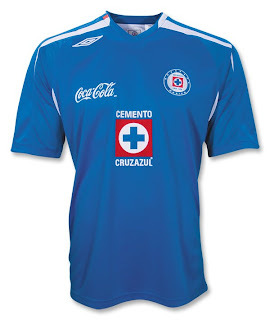 Umbro and Cruz Azul, two leading institutions in their field, started their comercial relationship in 2002. 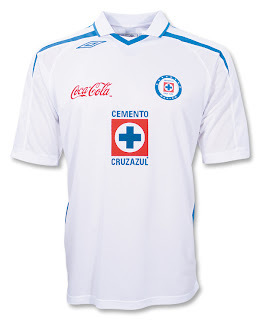 Since that time, Umbro has created collections of the highest quality, technology and good taste for Cruz Azul. Umbro dedicates 100% of its time to soccer. Our passion and dedication to this sport is unmatched in the industry. That is why Umbro can affirm, with all certainty that the collection of products Umbro Cruz Azul is as always the most advanced in its class at a worldwide level. The home jerseys weighs only 195 grams, 40 grams less than its predecessor, and the white 230 grams, 20 grams less than its predecessor. This has been achieved thanks to an innovative chemical finishing system which repels moisture, using a lightweight layer of chemical covering. This new system, is made based on a technical process which uses nano technology, which is based on utilizing molecules on a nano scale. To understand the dimension of this technology, suffice it to say that each nano molecule is one million times smaller than a grain of sand. But the nano technology does not only refer to the smallest dimension of the molecules, instead also to the materials used; and even more importantly, is how these nano molecules have been adhered to in order to carry out specific functions. The traditional chemical layers applied to the fabrics, cause the fabrics to feel thicker and with blocked pores. The nano treatments are sufficiently small to adhere to “individual fibers”, thereby obtaining with this a superior performance, a much better softness in the fabric and the comfort of the garment not sticking to the body nor maintaining moisture.